A family legend goes something like this: In the 1870s, two gentlemen by the names of Jean-Pierre LaCaff and Francois LaCaff, cousins (more or less), made the journey to the US from their native Luxembourg. 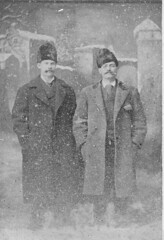 After a stop in Ellis Island, and some notes had been scratched in an immigration offical's ledger, they became John Peter (JP) Lackaff and Frank Lackaff. The briefly found themselves among fellow Luxembourgers in Minnesota, then accepted the government's offer of free land in an unsettled western territory -- north-central Nebraska. Frank briefly published a newspaper there before his wanderlust took him further west, and he ended up founding a massive Lackaff clan in the Pacific Northwest. JP, my great-great-grandfather, made a go of it as a rancher, and my family has been in the area ever since. 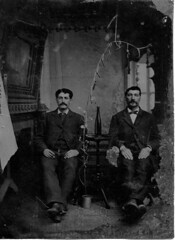 This is a photo of these first American Lackaffs, probably taken in Minnesota. My favorite part is the curious potted "cigar tree" -- I wish I was in on the joke. This photo of JP Lackaff and an unknown acquaintance is perhaps representative of the weather he found in his new country. I'm not sure how this photo was created -- I'm not at all a photography expert, but I'd guess the snowflakes were painted in after the fact. Also note the cigars, a common feature in photos of these early Lackaffs. 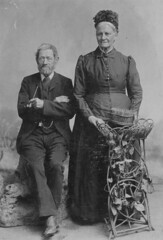 This photo, apparently sent from Luxembourg, is of JP's parents, Michel and Marguerite. A pipe, rather than a cigar, complete's great-great-great-grandfather Lackaff's stylish ensemble.